Acclaim Building Contractors can help your move up the ladder with a loft conversion you’ll love. If you’ve run out of space in your home, or need an extra room to accommodate your growing family, then the answer may have been right in front of you the whole time-- or, above you, to be more precise. Loft conversions are a fantastic way of making the most of your existing property, and we, at Acclaim Building Contractors have the expertise and experience necessary to make your project go without a hitch. 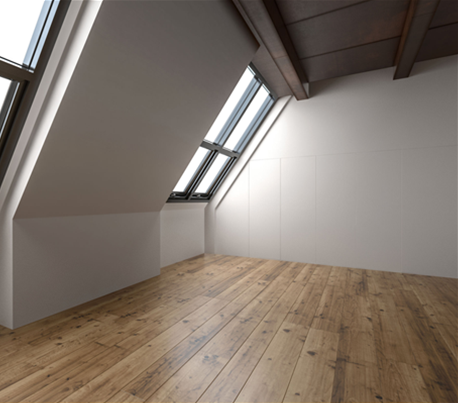 Ascertaining whether a loft can be successfully converted into a usable room is a tricky job, but it’s one we are able to undertake. We will not only inspect your loft, we’ll also liaise with you to ensure that we fully understand what you are trying to achieve. If you have a firm idea of what you want, we’ll design a conversion that meets your specifications as well as possible. If you’re not quite so sure, then we’ll make suggestions and give expert guidance to help you make the right decision. We design and do the work for every part of your loft conversion. This means you only have to work with one company, and we’re able to oversee the entirety of the project in detail. This ensures that your ideas for the development are never lost; it’s the same people involved at every point in the process, so your dreams are far more likely to become a reality. We’ll keep you clued in during the development too, communicating any essential information and checking in to ensure you’re happy with the work that has been done so far. We offer comprehensive loft conversion services that benefit from our years of experience, knowledge, and our attention to detail. We have accumulated a vast amount of experience over our 25 years in the building trade. There’s no problem we haven’t seen or barrier we haven’t overcome, and we’ll dedicate ourselves to making the most of our experience to ensure the best results for your home. All of our tradesmen are fully qualified to the highest standard, and hold either NVQ or City and Guilds qualifications. When we work on your loft conversion, you can trust that we have the knowledge to do the best job possible. We’ll inspect your loft and determine the best methods for conversion. Our experienced tradesmen will undertake all carpentry, flooring, joinery, building, plumbing, and electrical work. We can also decorate the finished conversion to your specifications, ensuring the space is ready to use as soon as possible. We have hundreds of customers who have been delighted with our loft conversion services, so why not give us a call and start the process today? "We offer an array of different loft conversion services, such as 'Velux conversions', 'Rear Dormer conversions' and 'Hip to Gable conversions'."